Marvel has started experimenting yet again. The last time it did something this drastic, we got the Marvel/DC Crossover in the 1990’s. 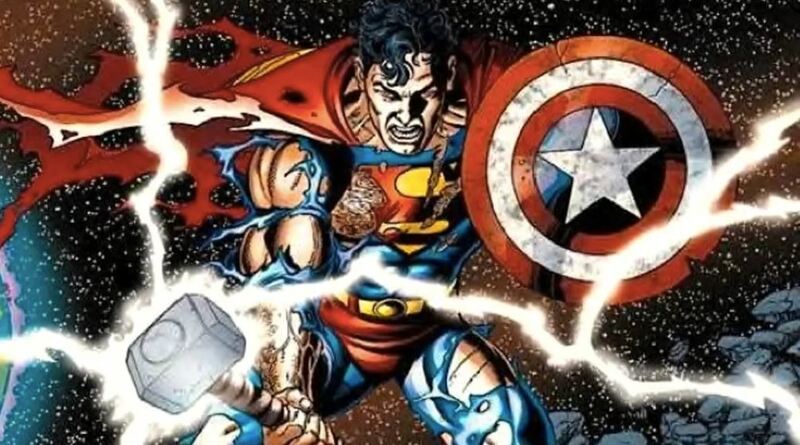 Remember the one issue that showed Superman holding the Mjolnir in one hand and Captain America’s shield in the other? That is the one we are talking about. In recent times, Marvel Comics sales are starting to plummet while its cinematic counterpart is soaring to new heights. In order to ensure both the wings of Marvel are balanced in terms of profit, Marvel Comics has decided to allow a superhero team to crossover to their rival DC Comics Universe. 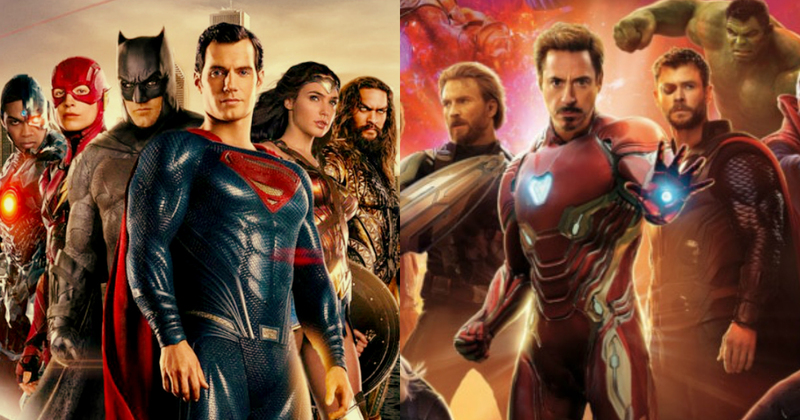 It may sound ludicrous but Marvel just ensured that the fans knew that the DC Universe and the Marvel Universe fall under the same Multi-Verse concept. Presenting Marvel Comics Update – Major Superhero team has a crossover with DC Comics!!!! SPOILER ALERT: MAJOR Spoilers for Lockjaw #4 up ahead….. The Inhumans TV Show did end up as a disaster but it still managed to introduce several popular characters into the mainstream viewership. Among them, the most memorable was that of Lockjaw, the telepathic Inhuman dog that can teleport to any part of the Marvel Universe in the blink of an eye. This gifted creature has been at the epicenter of all issues of Inhumans, appearing in all major Marvel story arcs. Lockjaw’s power, as it turns out, is not just limited to the Marvel Universe. He has managed to make a cameo appearance in DC Comics opposite none other than the Man of Steel. That’s right folks!! Superman and Lockjaw are now officially pals. Lockjaw #4 has introduced us to this fantastical concept of the Man of Steel and the telepathic Inhuman Dog going on adventures together. The issue provides a lot of incredible revelation for Lockjaw. His origin story has been changed forever. 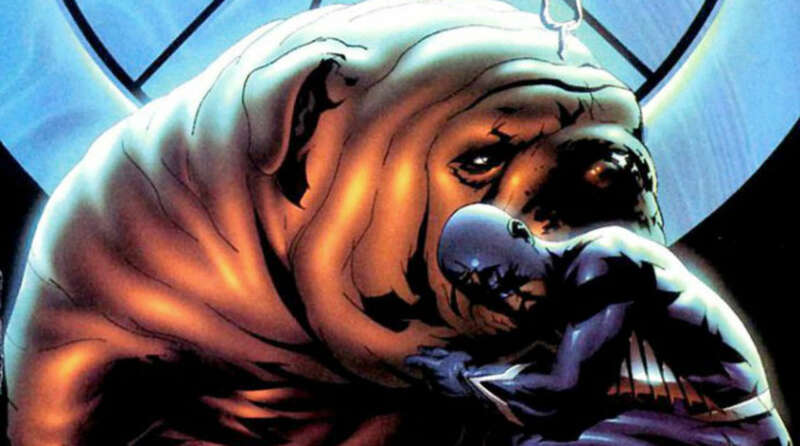 Lockjaw was thought to be the only child of his mother. As it turns out, there were siblings. When the mutagenic terrigen mist was introduced to Lockjaw’s Pregnant mother, Lockjaw was the first to activate his powers. He then teleported his siblings, that was still inside the womb, to safety. He would then later come back to his mother and everyone was led to believe that lockjaw was the only child. 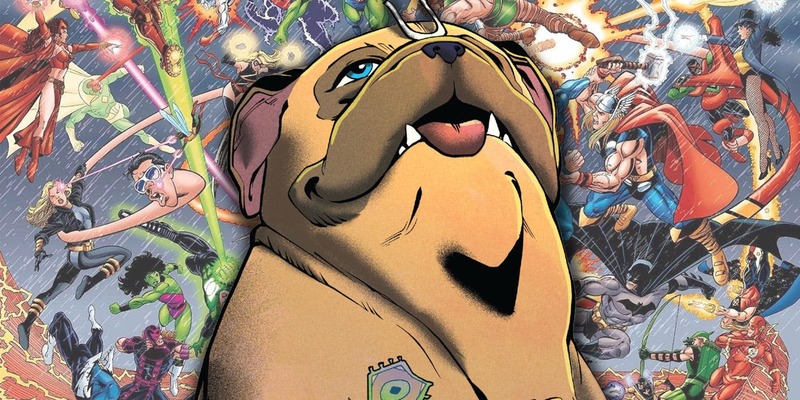 The Lockjaw comic book issues show us an interesting look at the Marvel Mythology of the strange world of the Super-Pets. The eponymous superhero and his wonderful sidekick D-Man, are currently in search of these lost siblings that might hold enormous powers in their genes. Annihilus, an insect-like villain of the Fantastic Four, has currently captured one of Lockjaw’s siblings. Lockjaw has to now fight Annihilus using his teleportation powers in full swing to transport his allies through various periods and historic places of the Marvel Universe like Asgard, the Negative Zone and the Pre-Historic Earth of the Universe. But it is the final place Lockjaw teleports himself to that has caught everyone’s attention. Lockjaw has finally traveled to the DC Comics Universe!!! The cameo is small. While Lockjaw teleports and hops through one dimension to the other trying to evade Annihilus, he finds himself in the DC Universe. 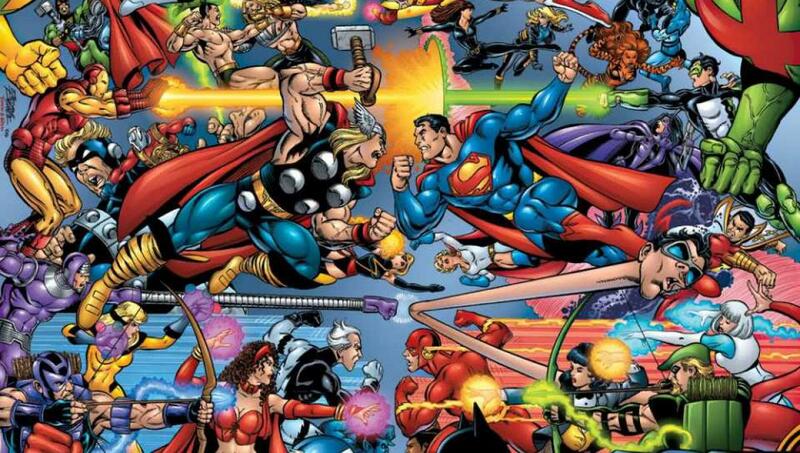 Due to legal issues, the Marvel Comics issue could not show Superman and Wonder Woman in their full glory as they are not the publication’s property. But the Red Boots and Cape of Superman, as well as the Amazon Skirt and the lasso hanging from the waist of Wonder Woman, is unmistakable. 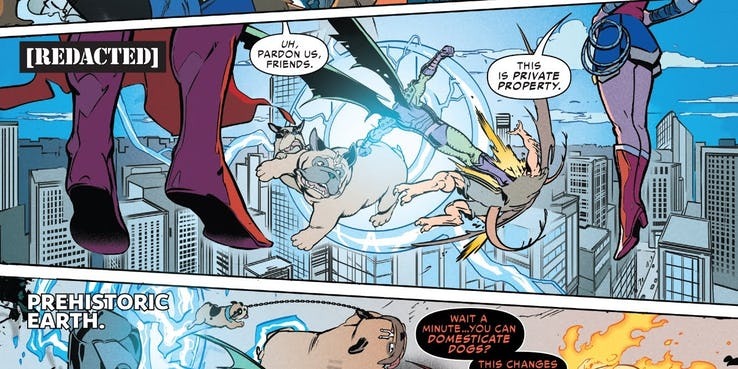 Lockjaw did travel to the DC Universe, albeit it was a much, much smaller cameo than we could have ever hoped for. This just goes on to show that the Marvel vs. DC animosity only exists within the cancerous elements of the fan base. In reality, the DC and Marvel Comics do not give so much of a damn and actually get along pretty well. There will be more crossover cameos in the coming months. The upcoming Infinity Countdown event promises interesting developments. There is a possibility that DC’s Shazam might be Captain Marvel in an alternate universe. There is also another rumor that Marvel is working on an issue where Spiderman dimension hops into DC’s Metropolis – home of Superman. There are also talks of another crossover comic book arc between Batman and Captain America. All in all, the fans couldn’t be more excited!!! Don’t Miss: Cyttorak vs Thanos: Here’s Why Mad Titan Is Going Down!